THE STORY - In this lauded Pixar animated film, married superheroes Mr. Incredible (Craig T. Nelson) and Elastigirl (Holly Hunter) are forced to assume mundane lives as Bob and Helen Parr after all super-powered activities have been banned by the government. While Mr. Incredible loves his wife and kids, he longs to return to a life of adventure, and he gets a chance when summoned to an island to battle an out-of-control robot. Soon, Mr. Incredible is in trouble, and it's up to his family to save him. THE GOOD - The animation is flawless and filled with stunning action. The humor is excellently timed and still holds up today. Filled with loads of social commentary that was relevant then and is relevant now. THE BAD - Overlong. The film has almost no steam up until the third act begins. "The Incredibles" is an all-time classic animated family film that still holds up to this day. Not only is the animation absolutely jaw-dropping in almost every way but the film as a whole is still relevant for both kids and adults. The characters, the social commentary, the humor, it all still fits within the mold of the lives we live today. With today's look at toxic fandom especially, the themes of "The Incredibles" ring more loudly than they ever have before. However, the pacing of the film's story is a bit off. While the end of the second act and the entire third act is filled with really exciting action and payoff to the story itself, the rest of the film cannot decide how it wants to approach the character arcs and the plot points. Moments will go on too long or not necessarily marinate long enough. All in all, "The Incredibles" is a classic that will stand the test of time and joins of the ranks of other all-time animated greats despite some minor issues along the way. Superheroes or as the film refers to them, Supers, are apart of everyday life. They roam the streets in their super wardrobe and live as normal people at night. Supers are widely loved across the world and constantly recognized for their efforts. At the heart of the Supers are a few incredibly popular ones such as Mr. Incredible (Craig T. Nelson), Elastigirl (Holly Hunter) and Frozone (Samuel L. Jackson). After an eventful night of Mr. Incredible saving a suicide jumper, stopping a train accident, and the wedding of himself and Elastigirl, the Supers begin to slip from the public eye. Mr. Incredible is sued by the city and the suicide jumper and many other Supers begin being exposed for their dirty deeds (sound familiar?) Supers are forced to go into retirement and live normal lives with normal jobs. After a few years of retirement, Mr. Incredible and Elastigirl have been living as Bob and Helen Parr and they even started a family. Three kids, normal jobs, and a usual schedule the Parr's live among normal people despite having superpowers. Mr. Incredible has been craving to get back into the action and "relive the glory days" as the film describes it, which has been costing his family countless heartache. After getting recruited to take care of a job from an unknown third party that only a Super could handle, Mr. Incredible finds himself living his old life again. While he is living absolute bliss of his olden days he discovers that the person that has been hiring him for these jobs is a former fan. Buddy Pine, who now goes by Syndrome, is a fan turned supervillain due to Mr. Incredible not wanting him to be his sidekick back in the day, ring any bells? Mr. Incredible and his family must come out of retirement in order to stop Syndrome's evil and superficial plan to become the next big superhero. As said before, the story for "The Incredibles" provides an interesting take on the superhero genre, even before the genre really blew up with the Marvel Cinematic Universe. The most relevant social commentary within the film is its message of toxic fandom. If you are unaware, there have been some incidents occurring where "fans" of franchises have been bullying the creative bodies involved in the said franchise. Specifically, Kelly Marie Tran being bullied to the point of her deleting all of her posts on Instagram due to the overwhelming amount of hate she received from Star Wars "fans" for "Star Wars: The Last Jedi." Buddy Pine is Mr. Incredible's number one fan when the film opens, referring to himself as Incredi-Boy. Buddy is such a fan that he even attempts to be Mr. Incredible's sidekick but Mr. Incredible casts him to the side claiming he prefers to work alone. This constant rejection by his hero causes Buddy to spiral downward and become the sinister villain Syndrome. Syndrome sets up an elaborate plan to kill Mr. Incredible and then replace him as the number one Super in the world. This is toxic fandom at it's utmost toxic and it is one of the main themes the film focuses on. Aside from the themes, the film is expertly made, as per the norm from the geniuses over at Pixar. Not only is the animation crisp and elegant (This was Pixar's first animated feature film to prominently feature human characters in the lead roles) but it's absolutely exciting to watch. One thing "The Incredibles" succeeds in that other superhero films lack is clarity. Most superhero films are loaded with action and a majority of the time that action is incomprehensible. 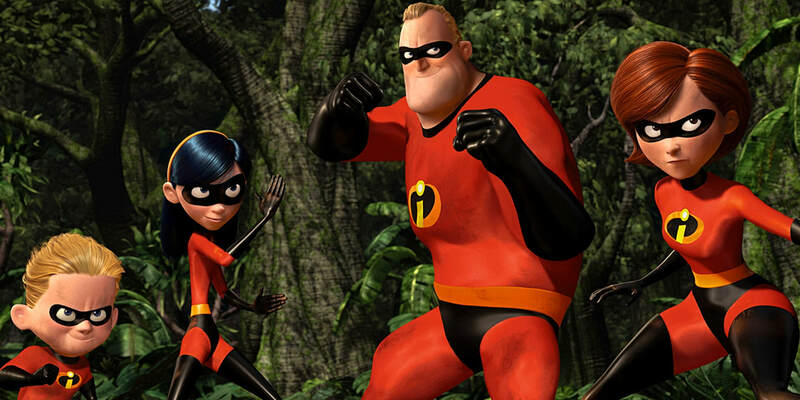 "The Incredibles" has action that is focused where everything is easy to understand and process. On top of the action being easy to grasp, it's also exhilarating, especially as the film approaches the two-hour mark and threatens to wear the audience out. The character work is expertly done so that when the stakes are increased, you can feel the tension that the characters are feeling. More superhero films should adjust to not only feature more clear-cut action scenes but also make sure that it plays a purpose for the narrative instead of sheer spectacle. While the film certainly excels in its execution there is something that does fall a bit flat. The pacing of the narrative is a bit lackluster. Although the story itself is fun and has a lot of things to focus on through the film's runtime, it can never seem to find the pace it wishes to go at. A scene will begin. It will make a point to let us know that this scene is going to play out a bit longer than other scenes, but then it will end too quickly before we have grasped the full emotional meaning of the scene. This happens often in the first act and vice versa leading to the more emotional beats of the story not to land as hard as they should. "The Incredibles" is an excellent film and completely deserved the two Oscars it walked away with for Best Animated Feature and Best Sound Editing. The sound work in this film is just as excellent as the visual work, especially when you consider it has to 100% be all made from scratch. With an engaging and important story that has loads to chew on in terms of social commentary, "The Incredibles" has endured as a classic. Although the film is paced rather poorly, it still overcomes this hump with some amazing performances from the ensemble, heart and some amazing humor. "The Incredibles" is easily incredible and hopefully the sequel follows in its predecessor's footsteps.